One of Wilson’s campaign posters. Note: During one of his Congressional campaigns it was said that his opponent spent $1.11 for every vote received, while W.B. Wilson spent less than a cent apiece. 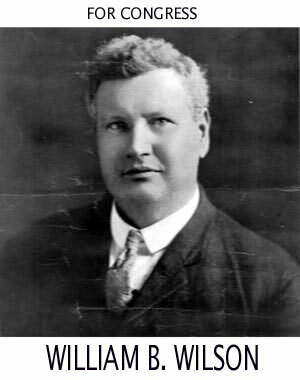 February 1884 – Elected township auditor (Bloss township). Wilson wrote about his first non-union elected office: “… In conjunction with my associates, [I] brought about a reform in the method of collecting taxes. An examination of the accounts disclosed a surplus of $300.00 in taxes collected… This was not a very large sum in itself, but quite large in comparison with the township budget.” He found that the company paymaster was also the township tax collector since the company owned nearly all the real estate in the township. By having the workers pay extra, the company didn’t have to pay as much tax to the township. Wilson was quickly able to clean up the situation. 1892 — Ran for U.S. Congress as a Democrat. Lost in Tioga County Democratic convention due to political backstabbing by another Democratic candidate, John Sweeny. 1902, 1904 — Told party managers that he would run if uncontested for Democratic nomination for Congress. Party managers found other candidates. Deemer had created a feeling of mistrust because of his activities during the flood of 1889 when he was accused of stealing a lot of lumber that wasn’t his. The Democratic party in Lycoming County was particularly strong and quickly supported Wilson. Although Tioga County was heavily Republican, Wilson had very strong personal relationships with many workers and farmers. Deemer’s organization had overestimated their strength in the county. During this term, Wilson served on the Patents Committee which revamped the Copyright Law. He also introduced a bill to appoint a committee to investigate mining disasters. Out of the appointment of this committee grew the founding of the Bureau of Mines and Mining, initially part of the Department of the Interior. In this campaign he advanced no new issues, but simply told the people what he had done and what he had tried to do. The people of the district must have been pleased with his activities during his first term as they re-elected him by a much larger margin. Again, his opponent was Elias Deemer of Williamsport. During the campaign of 1910, Wilson was a delegate to the British Trade Conference, and was there during all but three weeks of his campaign. In the previous campaigns it was said he was successful through his campaigning and personality. But the campaign of 1910 showed that he was successful because so many people loved and trusted him. Although far away in England, without power to campaign or take care of his own interest at home, he still won in a Republican district over a Republican candidate by about 3,000 votes. With this election the Democrats came to power in Congress and Wilson was appointed Chair of the Labor Committee. Wilson championed the cause of a separate Department of Labor, as these concerns now fell under the jurisdiction of the Commerce and Labor Department, one that would give the Secretary of Labor the power to act as mediator or appoint commissions of conciliation in trade disputes. Workers had agitated for a separate Labor Department and secretary since 1865. A commissioner-level position had been created in the 1880s, then folded into the Department of Commerce. As a part of Commerce and Labor, the bureau had been neglected in favor of business owners. The bill was sent to President Taft who did not sign it until one hour before the end of the legislative session. Wilson also served on the Committee for Mines and Mining and the Committee on Merchant Marine and Fisheries. In February of 1912 Wilson introduced a bill to improve the conditions and training of the Merchant Marines. In the House this bill became known as the Wilson Seamen’s Bill. He also worked on the successful passage of an eight-hour work day for women in the District of Columbia. Wilson was unsuccessful during his fourth campaign as there were not only the Republican and Democratic candidates, but a Socialist and a Prohibition candidate as well. With the division of votes going to four candidates, Wilson lost by 568 votes, and the Republicans once again were in office. In 1914 William B. Wilson made another unsuccessful bid for the House of Representatives to the Sixty-fourth Congress. William B. Wilson was an unsuccessful candidate for the U.S. Senate in 1926.